The power and effectiveness of scent is the reason scent marketing has exploded into a billion dollar business that spans many diverse industries, and no one knows this better than the team at Air-Scent International. Seventy-plus years of operation and refinements do give you an insurmountable leg up over newbies, dabblers and other competition. Naturally, the growth of any industrial expansion brings along with it a slew of bandwagoners who enthusiastically jump to take part with often neophytic understanding simply because it’s become popular and there’s money to be made at your expense. Onerous contacts, inconsistent service maintenance and inferior parts are just a few of the points that cause an endless amount of agida (heartburn) for businesses around the globe. So what makes Air-Scent shine over other supply companies? Our team breaks it down with seven reasons scent marketing distributors and end users such as managers and owners of HOA companies, casinos, hotel and hospitality brands and any other retails spaces should consider entrusting their bottom lines and reputations to decades of product development, laboratory refinements and extensive field-testing that far exceed industry standards. The business of scent is meant to attract a new type of consumer who is willing to spend the time to learn about brands. The selling power of scent lies in its ability to contribute to an immersive brand experience and the development of brand loyalty. Today’s consumers seek a meaningful connection to a brand that offers authenticity, social awareness and sustainability. They will not align themselves with any brand unless they are comfortable with its message. The power of a brand experience lies in its ability to feed into the subliminal needs of the modern consumers in a way no amount of white noise or other channels can. Unlike that iconic cinematic line that promises: “If you build it they will come,” the modern consumer needs and demands more. They use ad blockers, don’t believe even half of what they hear and eschew email campaigns. They won’t tolerate being stereotyped and their purchases often deviate from expected demographic lines. Scent marketing is a business that is closely allied to advances in cognitive science and an understanding of how our brains work. An adult can distinguish 10,000 diverse smells. An aroma travels first to the limbic system of the brain, which controls feeling and emotions, and it is this aspect that renders the human sense of smell unlike the other four senses. Similarly, a convenience store chain that introduced the smell of freshly brewed coffee near their fuel pumps increased their sales by 300%. According to the Ad Age 2017 Top Agency Report, brand experience is growing faster than advertising, PR, CRM and media at a rate that is second only to digital. For hotel lobbies and other retail spaces, establishing an immersive brand experience is a huge undertaking involving location, décor, employee uniforms, lighting, temperature and music. Starbucks is a prime example. The decor is dark green with wooden overtones, chalkboard menus soft music and the tantalizing scent of fresh coffee is everywhere. The design does not reflect the smell of muffins and biscuits and cookies even though they do sell them. Cineplex, Lowe’s and Singapore Airlines offer three more instances of the profitability of scent marketing. The entertainment complex features the smell of movie-theater popcorn in every possible corner of the building. Their scent brand is fresh popcorn, which trumps the other things they sell which include: pizza, nachos and other comfort snack foods. The context of smell is further augmented by the vision of watching popcorn as it is being created. Singapore Airlines was one of the first to develop a custom scent to spray into their hot towels to dispel the stale air in a pressurized airline cabin. The floral and citrus fragrance was so popular that the airline gave it the name, Stefan Floridian Waters. Lowe’s home improvement stores pump the scent of freshly cut wood at its entrance. Other airlines and airports have started taking their brands to new fragrant heights as well. Today’s marketplace is flooded with manufacturers of ordinary air fresheners and odor-control products of varying qualities, but all things not being equal; there is only one leader in the field of emotive ambient air care and that is Air-Scent. Since the mid-1940s, we have been a pioneer in the field of ambient air-care starting with Bob Surloff’s invention of the world’s first fan-operated air-freshener dispenser in 1946. He gave the brand the moniker, Air-Scent, and we have since developed and expanded into the most elegant areas of environmental fragrance enhancement, and our advanced, state-of-the-art scent diffusion technologies are adaptable to meet any business size requirement, large or small. Air-Scent is the undisputed master of ambient air care and scent-marketing solutions for retail and hospitality spaces. Why? Because no other company has the ability to marry creative diffusion technology and chemistry with creative emotive fragrances. When dealing with Air-Scent, industries including but not limited to: hotels, Home Owners Associations, hospitals, auto dealerships, retail stores, boutiques and casinos, have a right to expect the best from their choice of an ambient air care provider, and with Air-Scent, they get it. Below are seven important reasons why business managers and owners in any of the above-mentioned industries should consider switching from their current scent-marketing supplier to Air-Scent. Most scent-marketing suppliers are inconsistent when it comes to providing ongoing maintenance and this can result in high costs for repairs, replacement and adjustments. The Air-Scent distributor network guarantees a monthly visit in many areas from a professional service technician as part of the inclusive cost of the service. During these visits, the technician restocks, adjusts and insures that the equipment is performing at top capacity. Any malfunction or breakdown is never the responsibility of the client who is paying for the service. Business owners or managers will need to plan ahead to change a fragrance to suit the seasons, but unlike other scent-marketing companies, that’s all that is required for Air-Scent to comply. There are a myriad of year-round scents to choose from. Air-Scent is not limited, as many other scent providers are, in our ability to expand a signature scent into additional strategic areas including: elevators, washrooms and trash rooms. This lends a cohesive quality to any brand name and most providers do not initially offer this service. Further, in the case of hotels or casinos, we offer the ability to package and brand your signature scent within products such candles, reed diffusers, air sprays and any other retail amenity. In order for an evenly diffused fragrance to have the intended ambient, brand-defining benefits its meant to, it helps to minimize any competing malodors. There is no more powerful vaporous neutralizing additive on the market today than Metazene. Apart from being an industrial science marvel, this odorless, colorless neutralizing agent represents the mission of the modern deodorizer, which embraces health, the environment and consumer satisfaction. Modern commercial enterprises, no matter what the product or service, have shifted their focus from simply masking odors to establishing an effective method to neutralize and destroy foul odors forever. To accomplish this without affecting a chosen scent requires the level of expertise that only Air-Scent can offer. Metazene can be applied almost anywhere because it works via weight and a chemical reaction that destroys bacterial malodors at a molecular level. Other companies merely mask odors or claim to have a neutralizer within their products, but with further investigation, you’ll find that their products are not effective in the air. Their applications are primarily for topical applications. No other so-called deodorizer on the marketplace provides vaporous air freshening. Metazene bonds with the foul smelling molecules and this alters their electron patterns, which in turn nullifies their properties through hydrogen bonding, atom formation (adsorption) and encapsulation. The bad odors molecules sink and over a period of time, evaporate due to very low vapor pressure. With other scent-marketing purveyors, replacement parts can take a while to receive. Within the Air-Scent service area, this is never the case and replacement parts are shipped immediately. Even in the instance of an equipment malfunction, no client ever has to send back the system and wait for a new one to arrive, which could take days or even weeks. We outdo our competitors because we do not charge for equipment upgrades, which other scent-marketing companies do. Upgrades always conform to the latest cutting-edge technologies and innovations available in the world of industrial science. The problem with other company’s entangling contracts is that there is no easy way out. Business managers and owners can easily fall into that trap because at first glance, these legally binding agreements appear to be practical and economical. But like so many things in life, if it seems too good to be true, it probably is. In the end these contracts can lock an unwilling business owner or manager into keeping a system they are unhappy with, either because of poor service or performance. Even worse, a client can also be locked into the automatic renewal of contracts that can be for as long as three or more years! We offer flexility to satisfy the changing needs of our clients. Above all, we rely upon the established loyalty of satisfied customers. We have been providing superior pure fragrances that are backed by the keenest advances in science and more than seven decades of in-house and on-location testing with laboratory refinements that include cutting edge diffusion technologies. Our customers rely on our hard-earned expertise and promise to deliver the most effective and purest fragrances available anywhere. And they never disappoint. Whatever the mood a particular brand seeks to evoke, whether warm and exotic, fresh and clean or complex and elegant, we can create it with established premium fragrances that can realize any business requirement. Alma Flower and Honey, Lemongrass Sage, Eucalyptus Mint, Black Bamboo, Restful Lavender and Fresh Breeze are just a few of the myriad of scent choices our perfumers have designed to create a kaleidoscope of moods and emotions to accommodate any commercial setting. Read more about the many reasons distributors prefer our fragrances. How Does Air-Scent Cater To Specific Industries? Manipulating the power of fragrance means a fragrant path to increase traffic, revenue and ROI. Scent is the ultimate sales pitch for hotels, HOAs, auto dealerships and showrooms, retail stores, boutiques and casinos. Harnessing the power of fragrance transports consumers on a magical ride of emotions and memory. Air Scent’s vast selections of fragrances are one-of-a-kind and each serves its own marketable purpose. Restful Lavender for example, is calming and soothing and works well in highly stressed work environments such as retail, fashion and high-stake casinos, while peppermint introduced in busy offices has almost the opposite effect, providing stimulation, promoting mental clarity, energy and higher concentration levels. Fitness centers lean towards Air-Scent’s White Tea and Fig scent to motivate action; Eucalyptus Mint to inspire activity and Lemongrass Sage to either invigorate or provide a completely neutralizing scent. For public bathrooms, which are integral to every industry that interfaces with the public, lemon scents such as the extremely aromatic Genoa Lemon, evoke a sense of freshness and cleanliness. A clean smelling bathroom is as vital to winning customer loyalty as fairly priced services, products or good food, and no customer should ever smell anything unpleasant anywhere in any facility of any kind. Air-Scent diffusers can create the perfect mood for any location and they can serve as an application for every type of commercial setting, regardless of size. 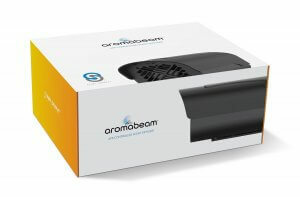 The Aroma Beam is the perfect ambient scenting solution for retail stores, hotels, showrooms, healthcare facilities and more. Its unique cartridges are specifically designed for linear diffusion for a 30-day period. Scent marketing is here to stay and so is Air-Scent. No one knows or understands the business of scent better than our complete in-house fragrance evaluators, chemists, product development teams and most importantly our perfumers, who are old world artisans and masters of fragrance aided by the modern benefits of the most advanced technologies. This collective group are the powers that be behind our company’s success. Seven decades of continuous, flawless operation, an in-house testing center for all our creations and the expertise of the finest chemists and researchers that money can buy are the collective amalgam that is Air-Scent and the reasons why commercial enterprises should switch their scent-marketing supplier to Air-Scent.